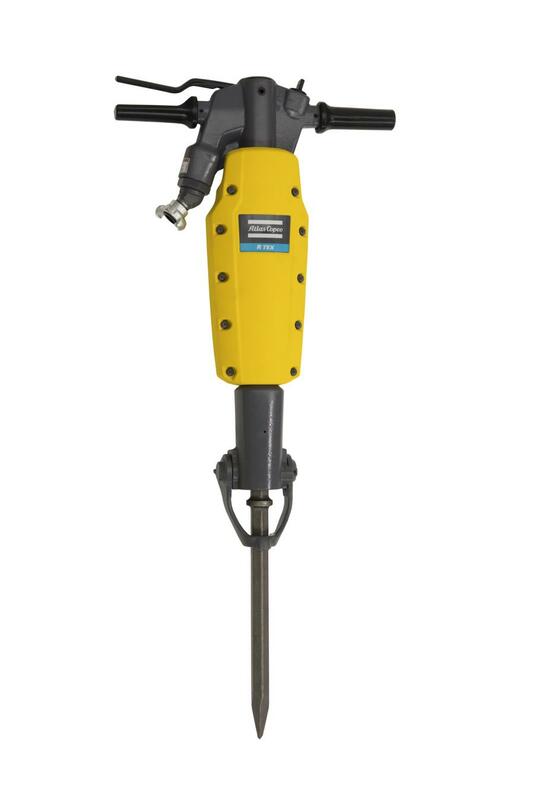 Atlas Copco’s RTEX pneumatic breaker offers rental centers and contractors a cost effective and powerful solution for demolition, maintenance and renovation projects. Atlas Copco' s new RTEX pneumatic breaker offers rental centers and contractors a cost effective and powerful solution for a variety of demolition projects. The RTEX requires just 37 cfm to operate, about 50 percent less air energy than conventional breakers in the same weight class. This gives contractors the option to run multiple breakers off of a compact air compressor, resulting in greater efficiency and a high return on investment. The RTEX has the breaking capacity of a 66-pound breaker or greater, but weighs only 55 pounds. Its Sofstart™ two-step trigger lets the operator start the breaker slowly for full control over the chisel's starting position and placement. The RTEX operates with a constant pressure control that features improved energy transfer from the breaker to the new RHEX power chisel. The RHEX chisel generates a powerful breaking force and features a concave tip profile to significantly reduce jamming and promote operator productivity. The constant pressure chamber sits at the top of the breaker and serves as an advanced pneumatic suspension, which minimizes vibrations. Since the constant pressure chamber sits at the top of the breaker there is no need for ergonomic handles — vibration values are comparable to a conventional breaker with flexible and vibration-reducing handles. This enhances operator comfort and allows the operator to work as much as eight times longer than with conventional breakers. The breaker's minimal vibrations also minimize stress on its internal components, which means fewer spare parts replacements and less maintenance. The RTEX features a long piston design that delivers double the interaction time — 100 milliseconds — of the tool with the surface than conventional pistons. This results in higher impact energy per blow and faster results than what can be achieved with conventional breakers in the 60-pound weight class. In a conventional breaker, air discharges each time the acting piston moves up or down. In the RTEX breaker, the air discharges only once — on the piston's return stroke, in which the constant pressure from the chamber pushes the piston down. Minimum valuable air is consumed, contributing to the high efficiency of the stroke mechanism.